It’s not as bad as you might think, especially if it is a small guesthouse with less people to share with. 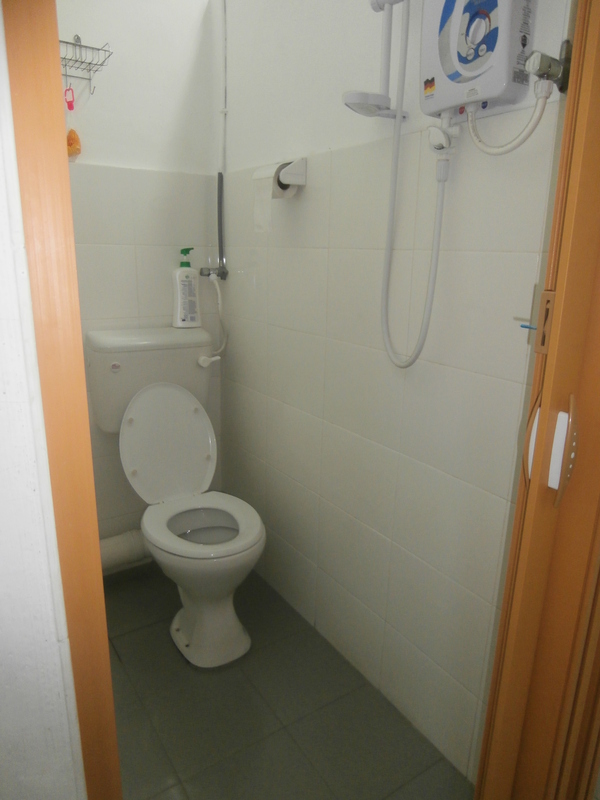 In fact, sometimes you get the place all to yourself, as happened to me the day I got locked in a bathroom stall in Penang, Malaysa. I had showered, as I do in guesthouses in southeast Asia where the toilet and the shower are in the same stall, in flip flops (to protect my feed from any nastiness), using the conveniently located toilet seat to prop my legs up for shaving. When I was done showering, I dried off with my 15”x 15” camp towel. Oh wait, no. This was a fancy guesthouse that provided its own thin, threadbare towels. 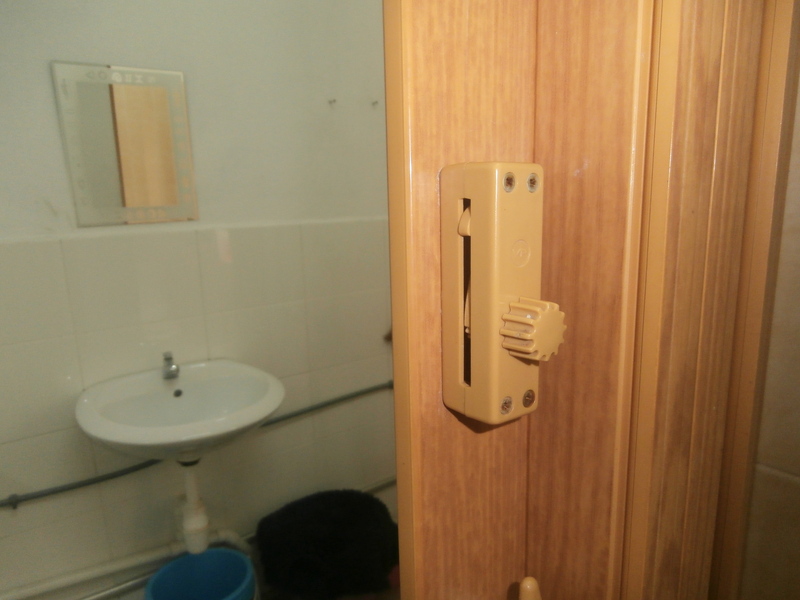 I was mostly dry and dressed and ready to exit the toilet/shower stall combo when I noticed the unlocking latch had been replaced with a rolled up piece of paper. Actually, I had noticed this MacGyver fix when I used the toilet in this same stall the previous day. But that time I had no trouble getting out of the stall. This time something went wrong with the clever repair. I don’t know whether the paper was worn down from use or the moisture from the shower had softened the paper, but it just spun in the hole and refuse to open the lock. OK, no need to panic, I thought. I pressed the paper harder into the hole and prayed to the toilet gods that the paper would catch and open the lock. But still the lock wouldn’t budge. Deep breath, try not to think about being claustrophobic. I looked around for something to move the lock. The only thing I could find was an air freshener on a hook. Hum, maybe I could use the hook to pull up the lock. I pushed the hook under the latch and pulled up. Nothing. I was starting to panic a little bit. Then I remembered that Sierra had come into the bathroom and was showering in the next stall. But I might as well have still had the place to myself because she was no help. “Oh, that stinks,” she laughs. I look around the stall again. How the heck was I going to get out of here? I couldn’t go under the door. It was an accordion style door that went all the way to the floor. There was space over the door, but it was too high for me to climb over. And probably too small. I was going to have to break out. Maybe if I pushed hard enough the latch would break. I felt bad about wanting to break the door, but, I mean, the lock function was already broken. . . I pushed and I pushed, but the lock didn’t budge. Then I noticed some give in the accordion fold. I pushed again. It started to split apart. One more shove, I could see the sink outside the door. I put my shoulder into it. Pop, I was out. Whew! I got out of there as quickly as I could. I didn’t even bother to tell the guesthouse staff that there was was now a gaping hole in their bathroom door. I just left the door flapping open and hurried back to my room. And my newfound freedom. Later that afternoon, I saw someone working on the door. I thought maybe they had repaired the lock, but no, there was just a fresh piece of rolled up paper and the accordion was pieced back together. Needless to say, I didn’t use that stall again. 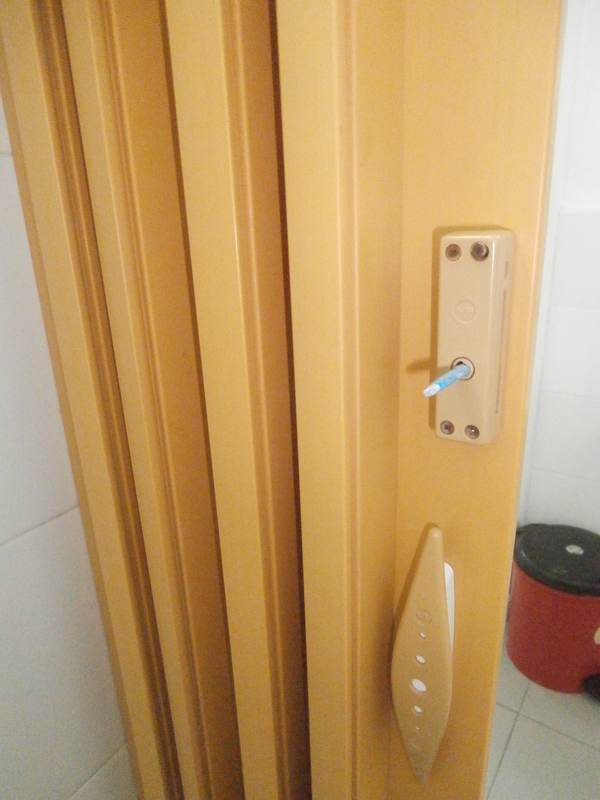 The next day, a new door had been installed. I never did admit that I was the one who busted through the door Incredible Hulk style. * I did not get a picture of the torn apart door because I was too busy running away from scene of the crime.